This Sunday is a big night for movies, with the Academy Awards ceremony set to air, after which ABC will air a special episode of Jimmy Kimmel Live. 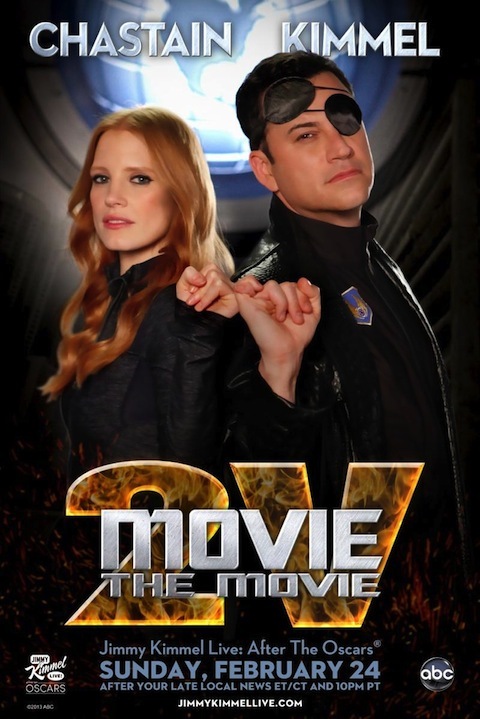 The promo for Jimmy Kimmel Live: After the Oscars promises a bevy of movie stars and the debut of the follow-up to last year's viral success Movie: The Movie, fittingly titled, Movie: The Movie, 2V. The promo below reminds us that Jimmy Kimmel's late night talk show is doing really well at ABC. The post-Oscar episode should give the show another boost, especially when we factor in the celebrities starring in the anticipated Movie: The Movie sequel, including Jennifer Aniston, Bradley Cooper, Oscar host Seth MacFarlane, Jessica Chastain, Jude Law and more. Check out the promo below. ABC says Movie: The Movie, 2V is the next biggest, most star-studded and spectacular non-existent film the world has ever seen.